Increasing operational efficiency is a key driver in Boeing Commercial Airplanes strategic plans for a healthy core business and expanded customer services. That's not a simple task, considering the operations infrastructure required for designing, building and servicing highly complex, technologically advanced products such as commercial jet airplanes, which have long life cycles. Boeing's ability to increase efficiency and set the stage for future growth opportunities is being aided by fundamental "road building" that began about 10 years ago. Boeing launched the Define and Control Airplane Configuration/Manufacturing Resource Management initiative in 1994 to redesign and simplify processes related to airplane design and production. A strategic Boeing initiative along with Lean manufacturing, asset utilization and quality management system, DCAC/MRM has had difficult challenges to overcome. What set DCAC/MRM apart from other initiatives was that nothing on this scale had been attempted in the airplane manufacturing industry ever before. In other words, not only was there no road map to follow, there was no road. DCAC refers to the redesigned processes and information tools Boeing uses to define the customer's airplane, control its configuration and issue manufacturing plans. MRM refers to the redesigned processes and information tools Boeing uses to schedule and plan production, order materials, manage inventory of parts and materials, and procure airplane components from suppliers. 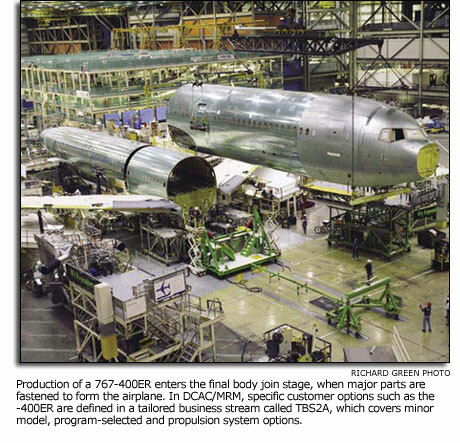 Boeing started using MRM in 1996 in its parts plants. Since then, both the DCAC and MRM processes and system have been introduced in phases that encompassed sales, engineering, quality, finance, manufacturing, information systems, business operations, external suppliers and customer support organizations for Commercial Airplanes. Last month, Boeing converted the 747 and 777 factory areas in Everett, Wash., and Wichita, Kan., along with the Structural Composites site in Frederickson, Wash. These moves completed DCAC/MRM implementation for Airplane Programs in Puget Sound and Wichita and have created a superhighway toward production improvements. This journey involved building and, in some cases, repairing and improving the road along the way. Prior to DCAC/MRM, airplane definition and configuration control methods dated back to wartime production in the 1940s. The parts-ordering process relied on a Boeing-built computing system installed in 1969. Multiple out-of-sync bills of material existed for each airplane.  Simplified configuration management tools, replacing World War II-vintage manual and error-prone processes with a streamlined and automated system enabling reuse of already designed parts, plans and tools.  Consolidation of airplane information in real time and its use as an accurate single source of product data, tailored for different business processes.  Tailored business streams that define each airplane component as a stable, reusable or custom package of design and production information.  Tailored materials management for ordering, scheduling and producing components based on tailored business streams.  Financial visibility of the costs incurred in building a single airplane. For nearly a decade, the vision of DCAC/MRM has remained constant, with a lot of hard work and perseverance. One key to this success is a "working together" model called the Integrated Design Team. It consists of business and technical experts from across Commercial Airplanes who make business and policy decisions to apply DCAC/MRM for the greatest benefit. "The IDT focuses its efforts on preventing rather than correcting business-related problems," said Tim Scallon, the team leader and a Boeing Associate Technical Fellow. "We often find that the best solutions might not be as simple as imagined from certain functional perspectives, but are simpler and more efficient overall for the company." An example is the bill of material, which is a list of the parts and materials that make up the airplane and what's required for assembly or installation. Previously, multiple bills of material existed in different systems for each airplane, often containing translation errors and redundancies. The IDT had to solve many of the unique situations that arose when the bill of material was consolidated. "Getting to a single integrated bill of material was crucial," Scallon said. "But we're just scratching the surface with what this integration can do for us, in seeing opportunities and applying the right solutions." "This is a true Boeing initiative that followed through on its vision," said Vanesa K. Oneill, a supply chain management analyst and DCAC/MRM subject matter expert in Auburn, Wash. Her job role changed in 1996 when Auburn Machine Fabrication implemented MRM. "Boeing's parts-ordering philosophy has changed 100 percent," she said. "These simplified ordering methods mean our requirements are based on consumptionwhat we use, we replace." Oneill said the biggest change for her is "getting involved with your product from the supplier through to the shop floor." Today, employees in more than 160 Boeing job roles are linked through their workstations to a single source of product data, common processes and a communications network that facilitates working together and sharing responsibilities. "We manage transactions today with leaner processes and more robust information," said Kathy Humenik, Information Systems director for Airplane Programs and Supplier Management. "The system has the flexibility and stability we need to implement Boeing as a Lean global enterprise." Kelvin Council, vice president of Finance and controller for Commercial Airplanes, added: "It's all about managing for value. MRM provides the ability to track and roll up costs through the supply chain. This results in dramatically improved unit cost visibility, which is powerful." Automated processes give a boost to the airplane construction "life cycle," a value stream that begins when an airplane is configured for the customer. Shortly after the 767 program implemented DCAC in 2002, it placed into production a 767-300ER totally configured by the customer using an electronic catalog of available options such as interior definition, flight deck features, systems, engines and landing gear. This airplane was a "customer intro," or the first of a specific model ordered by this customer. The customer-selected options in DCAC are defined within tailored business streams: basic, reusable designs and parts for the 767 model; specific options for the 767-300ER version and other available options; and requested custom options. These selections were then matched to the appropriate "modules"a logical configuration of parts, plans, tools, inspections and other related information that satisfies each option selection in an electronic configuration library. Greater reuse of existing modules reduces complexity in the bill of material. Previously, preparing the bill of materials and the cycle time to release engineering drawings and part information into production for a "customer intro" airplane was a lengthy process. For this 767-300ER, 90 percent of the modules were automatically selected from the available list and were loaded electronically into the bill of material in one day, compared to weeks of manual effort before. The parts-ordering process, manufacturing and factory instructions were generated electronically from the completed bill of material. "Our first 767 totally configured and built using DCAC has turned out better than expected," said Ronald D. Smith, an Everett-based customer engineering account manager assigned to this airplane. "We passed this DCAC test with flying colors." By implementing DCAC/MRM concepts, Boeing has made major operational improvements to the highway of interconnected processes, systems, data and people. From automating the airplane configuration with available options, to reusing engineering work, to streamlining the flow of parts, to better understanding the cost and resource demands, DCAC/MRM is smoothing the road to improved quality, greater production efficiency and more stability for Boeing Commercial Airplanes.